Sometimes called a Shore Lunch, the traditional lake-side fish fry is a quintessential Ontario experience. The taste of freshly caught lake fish with all the classic trimmings — baked beans, a hit of lemon, and a can of peaches for dessert — it’s perfect. Add to that a classic Canadian shield vista and you’ll lose your breath, we promise. Traditionally, shore lunches consist of fresh caught walleye, quick dredged in “top-secret” batters whose recipes have been handed down through generations. Hint: it’s flour, water, cornmeal, eggs and a good hit of salt. They’re served with a side of baked beans heated in the can, some bread and a good squirt of lemon. It’s a Canadian tradition. To take it up a notch, we nix the beans in favour of some Ontario corn tortillas from Chocosol, lime wedges and a tangy coleslaw we pre-make for our trips. Cabbage holds up well to heat, doesn’t get soggy and can withstand being shoved to the bottom of a pack — especially if you dress it last minute. Add to that a couple cold craft beers, and you’ve got yourself a shore side paradise! To host your own fish fry, you’ll need a few things. A shore lunch fireplace should be circular and at least two feet in diameter. If there’s no fire pit around, you’ll need to make one with flat rocks. 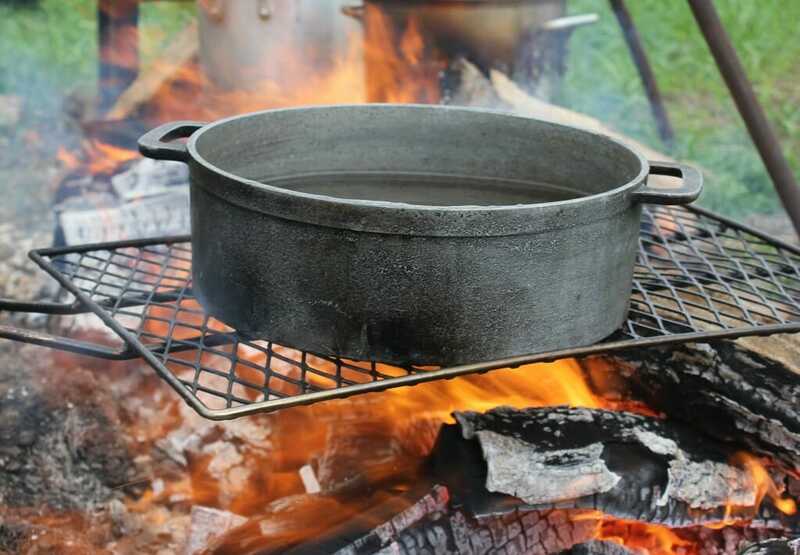 The less smoke the better, so dry birch, cedar or even driftwood is the optimum cooking fuel. Don’t go cutting down or foraging for wood. You want to leave your environment the way you found it. Light the fire and work towards creating a nice bed of coals. This ensures a nice even heat for frying — it will also keep the oil from cooling down when you drop in your fish. Place your grate over the coals. Make sure it’s not wobbly, then perch your frying pan on top. If you’re serving beans, open the can, bend back the flap and place on a rock near the fire. They will slowly start to bubble away. Once the frying pan is really hot, add a few inches of vegetable oil. Drop the dredged fish fillets in, and cover the bottom of the pan. Rock the pan slowly, allowing the hot oil to cover one end of the pan, then the other. As the fish cooks, the fillets will start to curl, and they’ll turn the prettiest shade of golden brown. Turn the fillets over with your spatula, and repeat the procedure while rocking the pan. Pull the fish from the pan and sprinkle with a generous helping of salt. The fish are at their best right out of the pan, so dig in! Remember that whatever you catch and eat for your fish fry counts towards your bag limit. While it is possible to replicate a classic shore lunch at home, there’s something about the smell of the fire and the sound of the lapping lake that make doing it lakeside unparalleled.